For folks not in easy driving distance of the Twin Cities, you can use this post to find roommates to share a hotel room/Airbnb with, or connect up with locals who are able to host some attendees for the weekend! There are quite a few hotels in downtown Minneapolis that are an easy bus ride away from the Waterbury building/GPS Event Horizon Community Center. Google Maps should be able to give you the logistical lowdown on that, depending on which hotel you're looking up. Metro Transit also has your back for planning your bus route. Locals, if you have some guest rooms or couch space you're able to spare, please post to let folks know! Any space available at an individual's home is at their discretion, of course. An informal, two day convention for podfic creators and listeners! Join us in Minneapolis for hanging out, discussion, and recording. Where can I stay if this isn't at a hotel? The Event Horizon center is a convenient bus ride from downtown Minneapolis, which has many hotels. There may also be locals who can accommodate a few people, at their discretion. We encourage finding roommates and renting some local Airbnb's within walking distance of the venue, which has worked out wonderfully in past years! Visit the Lodgings Finder post to connect with people looking for roommates for the weekend. What's the Event Horizon center like? We have access to three rooms, one that has some comfy couch seating for hanging out and chatting, one for recording that's as sound isolated as is possible, and one for panels. We also have access to a small kitchenette. Public restrooms are just down the hall and parking is free. We want to accommodate any accessibility needs that we can. You can find our accessibility guide here. If you have any concerns or questions, please don't hesitate to reach out to us. Do I have to be over 18 to attend? Yes, since discussions can be of a mature nature, we ask that attendees are 18 years of age or older. Children under age 1 are welcome in the con space as long as they are attended by their parent/guardian. revolutionaryjo and bessyboo are your co-conchairs, but it takes a village. If you're interested in helping us staff this thing believe us we're interested in your help. Get in touch. If you're not up for that much responsibility, but still want to help we'll be calling for volunteers closer to October. Keep an eye out! You can register using a variety of payment types here for $50.00 + $3.08 Eventbrite fee (USD). This is an unavoidable increase over prior years due to increasing costs associated with our venue. Everybody wants to live in NE Minneapolis, what can I tell you. Can I purchase a supporting membership or donate? We don't have a lot to offer you beyond endless thanks, but we'll happily mail you a copy of the programming guide after the convention if you chip in at least $25.00 USD. The best means of payment is via PayPal to podfication at gmail dot com. (If you'd like us to mail you that programming guide, please include your postal address in the notes!) If PayPal is a no-go, reach out and we'll figure out another way. Do you have a scholarship program I can donate to? You are a world class human being, friend. If you'd like to donate to cover the cost of registration for someone, the best way is to PayPal $50 per donated registration to podfication at gmail dot com. Be sure to note for us that what you're sending is a scholarship, or we'll assume it to be a general donation. If you can't do PayPal, reach out to us and we'll figure another way. Do you have a scholarship program I can apply for? Hopefully! We'll make a post here as soon as any scholarship donations are received for folks to claim via screened comment, along with more details. We'll be periodically updating this community as time goes on with more information. In the meantime, if you want to ask us a question directly, send over an email (podfication at gmail), a tweet (@podfication), an ask at podfication.tumblr.com, or drop us a comment here. We look forward to hearing from you! Save the Date: Podfication 2019! Mark it down on your calendars, we'll be hosting Podfication October 19-20, 2019! Registration is forthcoming. Keep an eye on this space for details. The Podfication 2018 schedule of events is here! Live performance sign-ups for 2018 are now open! Please read the rules below as there's a minor change from last year to be aware of. This event is a chance for anyone who'd like to do a reading for a live audience at the convention. It's a lot of fun! You can do something new, something you've recorded before, an excerpt from a longer work (give us a heads up on that please), arrange or join a multi-voice performance, or whatever you like so long as it abides by the rules below. Performances should not run longer than 15 minutes total. The form will remain open through Saturday, September 29, 2018 at 11:59pm CST. Any questions, just let us know! Drop us a comment, tweet (@podfication), ask (podfication.tumblr.com), or email (podfication at gmail). The GPS Community Center is located at 1121 NE Jackson St., Minneapolis MN 55413. There are quite a few hotels in downtown Minneapolis that are an easy bus ride away. Google Maps should be able to give you the logistical lowdown on that, depending on which hotel you're looking up. Metro Transit also has your back for planning your bus route. As always: You may be tempted to stay at the University Inn off of 4th St as it's the closest hotel to the center, but trust me and do not do the thing. Maybe something has changed in the last decade since I lived in that area, but I know it as a place to avoid and am thus passing on this important info. So now that we've got the schedule out there and y'all can make some informed decisions, we're looking for some volunteers! Our needs are small, but we definitely can't do this thing without you. There are a lot of chairs. They mostly need to be in theater style in rooms 107 and 106A. If chair moving is your passion or even just your "Eh, I could do that" let us know! We'll also need some help setting up the soundproofing equipment in room 106A, the AV equipment in 107, and putting up signage around the Waterbury building directing Podfication attendees to our rooms. 10/13 Update: We are now good on volunteers for this. Thanks! We'll provide food and plates and such, but we need a few people who can set it all out just before noon on Saturday and put it all away afterward! Or hey, if you're local and have a real knack for buying lunch meat, tubs of peanut butter, and paper plates, we'd love to let someone spearhead the pre-con portion of this endeavor too so we can stay focused on organizing everything else. 10/8 Update: We are good on this for both the pre-con organization and the setup! Thanks, volunteers! Just some basic cleanup and storage duties before we leave the premises on Saturday night. 10/4 Update: We are now good on volunteers for this. Thanks! We'll need 3 people who can each take an hour shift each at the door during Live Performances to let people in and out of the room between the readings. 10/8 Update: We are now good on volunteers for this. Thanks! All the chairs that were set out will need to be stacked up again and the soundproofing in 106A and other equipment taken down and loaded into cars before we go, plus any last minute cleaning so we can leave the nice people at GPS the rooms just as we found them. 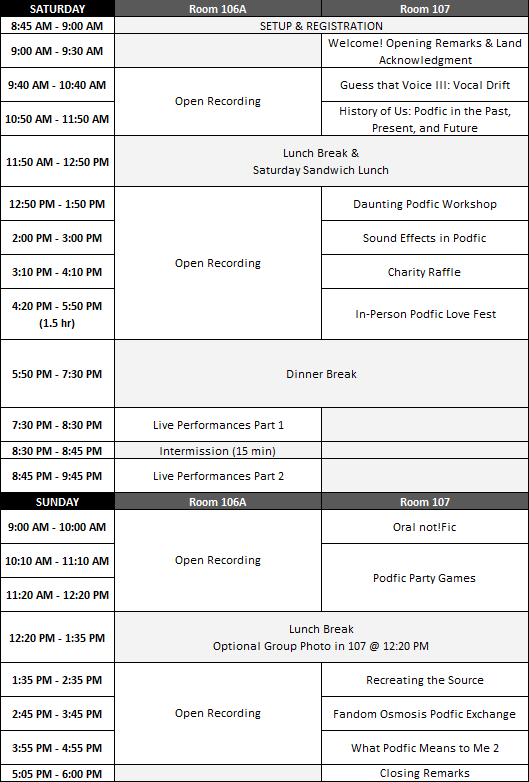 We may need some folks to help us move chairs between 107 and 106A for things like the Not!Fic Extravaganza and the Live Performances on Sunday, depending on if there are enough for both rooms or not. Keep an ear out if you're available during those times because we might ask whoever's around if they can help. We may append this post if other things come up, so check back periodically! If you're able to step up to do any of these things, please let us know! Drop us a comment, tweet (@podfication), or email us (podfication at gmail). Here it is, friends! The official Podfication 2016 schedule of events. GET EXCITED! To help everyone plan what they'll be recording over Podfication weekend, here's how the on site recording room (106A) is going to work! Firstly, signups will happen on site on a first come first serve basis. We'll have a signup sheet available that will be posted near room 106A starting first thing on Saturday morning. Individuals can sign up for a max of two sessions of recording time. If you're participating in someone else's group project, that won't count against you. Feel free to be in as many of those as you like! Fic recorded in the room should be no more than 10k to make sure time limits aren't exceeded. If you want to take on something longer, do so by all means! It's just that doing it on site is not the best option. We're planning to have official con time clocks set up inside and outside the room to help you keep track, but please be considerate of your fellow attendees and wrap up and leave the room before the start of the next block! If the room is open and no one's reserved it in advance, it's absolutely okay to use it! But you absolutely need to be out of it before the next session starts. No ifs ands or buts. If you're wrapping up a session and there's no one scheduled after you, prop the door open to signal to folks that it's okay to use it. We'll go over all this during opening remarks and info will be included in the programming guide as well. We've set aside a three hour chunk of time Sunday afternoon for this, which should allow for 11-12 performances. Hopefully y'all sign up and we don't end up sitting around staring at each other awkwardly that whole time. Sign-ups will remain open through October 14th, 2016 at 11:59pm CDT. Or, you know, when I wake up the next day. Performances can't run any longer than 15 minutes. While this is mostly an event that's performance for performance's sake, we are planning to record it if technology allows! After the con, we'll post a copy of the recording for everyone's enjoyment. There is an opt out if you'd rather not have your performance included and/or if you don't have author permission. Update: You can do something new, something you've recorded before, an excerpt from a longer work (give us a heads up on that please), or whatever you like so long as it abides by the rules above! AUTHORS! Ever wanted to write a fic made for group recording? Fic writing friends! Want a chance to have your fic recorded by a group of podficcers in the same room? We would love for you to write us something! We are accepting stories/scripts of 5,000 words or less that have been written specifically to be performed by a group of people in the same physical location. There are all sorts of things that are much easier when podficcers are all in the same space, like super fast back-and-forth exchanges, interruptions, people yelling over each other, people moving closer to or away from the microphone—the sky is the limit, really! Think of it sort of like pod_together, but with an added twist. There are no restrictions on fandom, pairings, ratings, etc., and while we will endeavor to make sure every finished story that is submitted gets recorded, we make no guarantees or promises. We’ll still have to find performers who are interested in recording each fic; popular fandoms/pairings/etc. will be much more likely to get recorded, simply because it will be easier to find people interested in participating in them. To submit a fic, email a copy of the text or send a gdoc to podfication [at] gmail [dot] com by October 14, 2016 @ 11:59PM CDT. Please be sure to include your AO3 name somewhere at the beginning of the text/gdoc. If you have any questions, don’t hesitate to ask in the comments of this post, on twitter (@podfication), or to the above email. UPDATE 2: You guys rock. We've covered all of the rental costs, and are leaving donations open now for food costs. Panel submissions will remain open until 11:59pm CST on September 10, 2016. We'll try to fit everyone in, but be aware that we are working within a limited amount of time and space. If you're willing to run it, it's more likely to make the final schedule. If you're not willing to run the panel, but you can talk someone or someones into it, have them get in touch with us to commit to it before the deadline. If we know there's someone to run it, it's more likely to make the cut. You can submit more than one idea! If you favor one over others though, let us know. Panels will be 45 minutes each. We're going to procure a screen, projector, and speakers for the panel room, but you'll have to provide your own laptop or other device to connect up to it. We're decidedly low tech, so don't assume we have the right cord to hook your device up. Bring it with you if you got it. VGA and HDMI are the safest options for most projectors. You can submit discussion panel ideas as well as formal demos. So here's the deal: we will waive your $5 registration fee, and you will receive $175.00 towards travel & lodgings. PLEASE NOTE that this is all the money that is available, and it's likely not enough to even cover roundtrip airfare from anywhere, so you will have to cover the remainder of your travel expenses yourself. In order to apply, please reply to this post with your full name, online handle (if different from the logged in account you are posting from, otherwise no need), and email where we can contact you. You MUST be able to receive a PayPal payment from us. All comments will be screened. We're not going to ask for your bank statements and tax returns or anything, but guys, please, honor system: please only apply for this if you really want to come to Podfication, and this $175 is the difference between you being there and not. This post will stay open for a week until July 22 12:01 AM CDT (GMT -5). We will use a random number generator to select a recipient, and will notify them later that day. Hey everybody! We're pretty excited about how many of you have registered so far and hope you're excited about coming to Podfication too. Now that we know there will be actual people in attendance, we thought we'd get a post up to brainstorm the sort of activities/programming we'll be running over the course of the weekend. Drop us some comments! Unofficial Friday Night Dinner Officially we don't get started until Saturday morning, but unofficially we know a lot of you will be in town before that. Saturday Night Option Organized outing to a local club (for the dancing inclined!) or a quieter evening of board games and chatting. Call for Fics Call out to authors who would like to write something under 5k that is intended to be read out loud by multiple people in the same room. More details on this as we hash it out, but larger/well-known fandoms preferred and no guarantee that the story will end up getting recorded, of course. revolutionaryjo - Save the Date: Podfication 2019! revolutionaryjo - Podfication Schedule 2016! revolutionaryjo - Live Performances Sign-Ups! bessyboo - AUTHORS! Ever wanted to write a fic made for group recording? bessyboo - We need your help!